Thought I’d post a quick video on where the jacking points are on a Boxster and how to lift it onto stands. They'll be a lot of situations where you'll need to get under your car and you'll want to do it safely. To do this you will need to know where on a car is strong enough to be a lifting point and where to safely position stands. The quicker and, in my opinion, safer solution is to use a set of ramps. I'll go through both options. I listed the ones I use in the youtube description box. 2. Park your car on a level surface. 3. Then you’ll need to find a strong enough place on the car to lift it by. There are two solid mount areas on side of the car. Check out the video above for where they are. 4. Most jacks have a release mechanism which allows the jack to lower. To start you'll need to turn the handle clockwise to lock it ready for lifting. 5. If you just need to raise the front of the car place you jack on the lifting point near the rear wheel. Jack until your car is high enough then place a stand under the front lifting point. Slowly lower the vehicle to rest securely on the stand. Repeat for the other side. It’s the opposite approach if you just want to lift the rear of the car but remember to place chocks under the front wheels to stop the car rolling forward. 8. Test the car is stable by giving it a moderate push - you want to make sure it’s safe to work under. 9. The other option is to use ramps. The disadvantage is that they are more expensive and can only lift one half of the car. They are also no use if you need to take they wheels off. The advantage is that to use them you simply drive on them so save a lot of time and I personally feel much safer working under ramps than stands. I got mine from Race Ramps. 10. Lowering the car back down is the opposite of the lifting process. Don’t forget to use a torque wrench to tighten your wheel nuts to the correct torque. On my Boxster the wheel nuts should be tightened to 130 Nm. 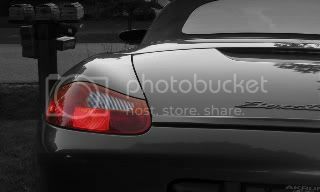 When lifting the front of a Boxster, is there a single point in the front you can lift the entire front end that is well clear of the two front jack points? If so, where is that point? The idea would be to lift the front end at this point with the lift in one area, and then be able to place both jack stands and lower the car evenly onto them. When I was on my original suspension which was worn out after around 110,000 miles I was at Roebling Road Raceway and I needed to swap my front tires side to side, I seem to recall that I was able to jack up the front and swap the tires. But I have never been able to repeat it, it is always the two tires on the same side of the car that come up. I now believe I must be remembering it wrong and that I must have used a jack stand to hold one side while I lifted the other side. Jack from the back of the car, as shown here (from the 101projects.com) and put two jackstands under the rear two jacking points. That is lift #1. Then lift from either side in the front using the front jacking point shown in that same link, and then set two jack stands in the front. That is lift #2. It’s maybe difficult for many to understand, but it’s a VERY good assumption to conclude that German cars are not designed for DIY maintenance or repair. It’s pretty good to assume also that the only lifting points provided by Porsche are those that correspond to Porsche specified lifting equipment all dealers are required to possess. That and what you can do with the supplied tire changing jack. Something someone posts on a forum is use at your own risk as opposed to engineering tested and approved. Real engineers are well aware of liability. WHAT?????? Are you kidding? "but it’s a VERY good assumption to conclude that German cars are not designed for DIY maintenance or repair." this is nonsense. I have been working on these cars for 25 years and have NEVER come to this conclusion. Hey, I'm with Boxfix. It's a car. Find a good solid place, specifically those illustrated by Pelican in Steve's post, and crank her up! What is difficult to understand is why you made that assumption. The world is full of people that maintain their Porsches safely. The supplied tire changing jack is the worst tool for maintenance. Real engineers can take their Porsche to the dealer if they like. Bought my Box 10 years ago, never having done anything more involved on an automobile than changing the oil. Since then I’ve done an alternator, a front wheel bearing, R/R a water pump/low temp thermostat, brakes (pads & flushing), clutch hydraulic flush, transmission fluid changes, R/R a fuel filter, and a front motor mount replacement. I’m sure there’s a thing or two I’ve left out. And, of course, a number of oil changes as well. That’s with no previous experience and no lift---a jack and stands only. And if I can do it…well, you know the rest..